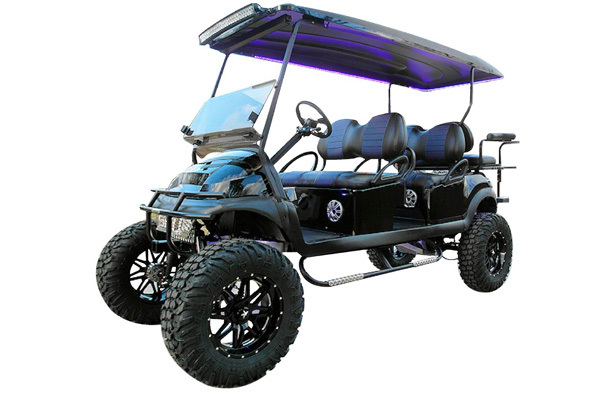 Highly customized 2016 Club Car Precedent stretched 6 passenger gas “Limo” golf cart. This cart has the newly-desgined Fuel Injected 14 HP Subaru gas engine, and like all of our carts, the entire cart has had a fresh full reconditioning service. It features a custom stretch conversion, and the following: “Monster” 11″ lift kit, heavy duty rear leaf springs, heavy duty rear shocks on the back and heavy duty adjustable air shocks in the front, 16″ M26 Vibe Milled wheels with huge 30″ MotoVator steel belted radial tires. New black bodies, custom stereo system with 5 channel 800 watt amp, Bluetooth stereo, (6) Polk Marine speakers, 10″ Subwoofer, black 112″ extended top, rear flip seat, custom Black with Blue Freestyle Wave hand pleated upholstery, Blue LED accent lighting throughout the underbody and in the underside of the roof, custom carbon fiber dash, black powder coated brush guard with built-in hitch mount, newly-designed black powder coated drop down nerf bars with diamond plate steps, custom carbon fiber steering wheel, second row cup-holders, matching rear seat armrests/cup holders, Ultimate LED light kit (includes LED headlights, LED taillights, LED turn signals, brake lights, emergency flashers; and a horn), 5 panel mirror, 32″ Cree Curved LED light bar, tinted folding windshield, wheel spacers for a wider stance, rear disc brakes for more stopping power, high torque clutch spring, and slow moving vehicle (SMV) sign. The cart rides extremely smooth and is a real head turner! We can also add an uncommon key so no one steals your ride, a front mounted clays storage basket, Cree 4″ LED light cubes mounted on the brush guard, or add anything else you can think of! And we can also add the all new GPS Tracking device to any of our carts to be able to track and know where your toys are at all times! And we can install one in your boat, RV, Jeep, ATV, Side-by-Side, and even your teenager’s car! All of our carts include a Limited Warranty and free 3 month maintenance package, applicable at our shop!